And so ends a stretch of beautiful Springtime weather, featuring spectacular sunshine and splendid 70s across (most of) New Jersey. Our weather becomes much more active over the next week — that means the forecast is about to get complicated. We're starting off Thursday morning with another batch of dense fog. Just like Wednesday, the thickest fog is along New Jersey's coastline, where visibilities have sunk to a quarter-mile. A Dense Fog Advisory has been issued for Monmouth, Ocean, southeastern Burlington, Atlantic, and Cape May counties until 9 a.m. Thursday. The fog is also more pervasive, with reduced visibilities across the rest of the state too (on the order of a mile). Slow down, use fog lights and/or low-beam headlights, etc. I believe visibilities will improve significantly by 10 or 11 a.m. Meanwhile, we'll feel increasing humidity and a stiff breeze Thursday, as skies become mostly cloudy. There's a slight chance of a shower around the midday hours. (But the better chance for rain will come later.) Most high temperatures should push into the 75 to 80 degree range Thursday afternoon, although it will be a bit cooler in North Jersey and along the Jersey Shore. As a cold front approaches New Jersey in the late afternoon to evening hours, it will likely fire off a line of scattered showers and thunderstorms. While not everyone in the state will get wet, these storms are worth watching because of 1.) their timing coinciding with the evening commute, 2.) the day's warmth and humidity serving as sufficient fuel, for 3.) the potential for strong to severe thunderstorms. 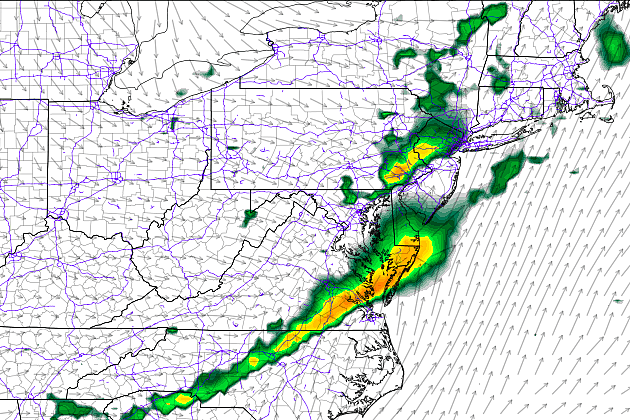 --Location: Strongest storms most likely along the western edge of New Jersey. --Impacts: Pockets of torrential rain are likely. Gusty 60+ mph winds and hail are possible. There is a non-zero tornado risk too. 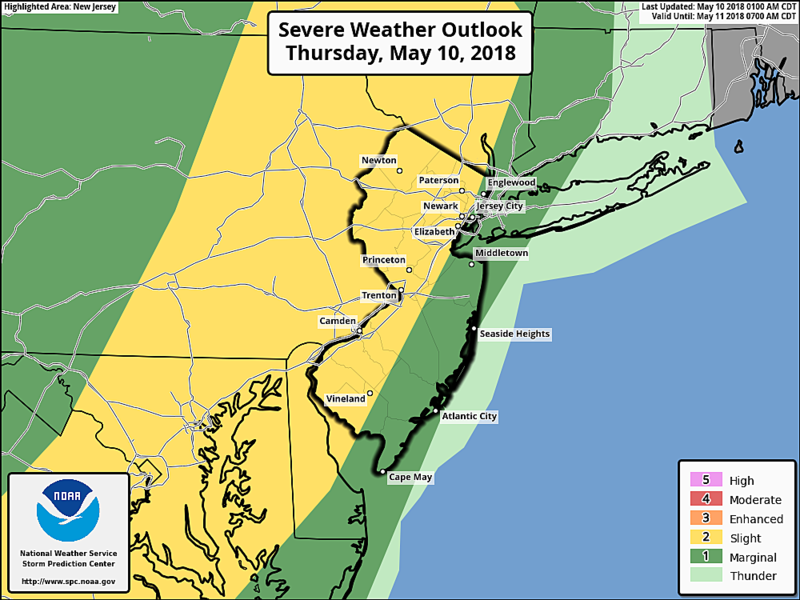 The Storm Prediction Center has put the western half of New Jersey in a "slight risk" for severe weather Thursday — that's the 2nd lowest of five severe weather risk categories, certainly enough to warrant a raised eyebrow. The Storm Prediction Center's severe weather outlook for Thursday. After showers exit the state Thursday evening, we'll see clearing skies after Midnight. Overnight lows will dip into the mid 50s. We'll enjoy a brief return to pleasant weather on Friday, with partial sunshine and seasonable high temperatures in the lower 70s. The NAM forecast model is promoting some light rain showers Friday afternoon, but I've opted to leave it out of my written forecast given poor consensus from other models. Things get quite unsettled for the weekend. That's a fancy way of saying that clouds will win the sky, there will be a chance of a shower or thunderstorm at any time, and the temperature forecast is very tricky. On Saturday, Thursday's cold front will creep northward as a warm front. The latest guidance suggests this frontal boundary will stall right on top of New Jersey. That front will provide a "highway" for storm systems to deliver bands of rain throughout the day. I really don't want to pinpoint the timing of these raindrops too much, because 1.) there's no major forcing at play and 2.) we can't pinpoint exactly where that front will stall. Who gets the most rain, and when? Can't answer it — you'd have better success with a dartboard or pair of dice. As the rainfall forecast is very much subject to change, I only recommend that you keep an open mind and umbrella handy throughout the day. Additionally, I expect a wide range of high temperatures on Saturday afternoon due to that boundary sitting right over central NJ. North Jersey will be on the cool side, with highs only in the mid 60s. 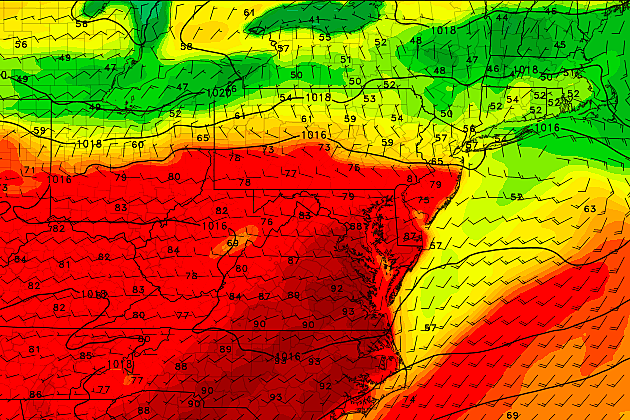 (In fact, the NAM model keeps northern NJ in the 50s at best on Saturday.) South Jersey will end up on the warm side, with highs potentially reaching the lower 80s. (As warm as 84 degrees, according to the GFS model.) In the middle? 70s a good bet for most of the state. But again, I can't say for sure who will end up on either side of the line. By Sunday, the aforementioned frontal headache will drift south again. That means the storm track will shift too. It also means the entire state may end up on the cool side of the boundary, limiting high temperatures to the lower to mid 60s for the second half of the weekend. The early look at next week's forecast keeps the unsettled, occasionally wet weather coming. We'll warm up for the early part of the week, with scattered 80s in the forecast for Monday and Tuesday. Each day will include a chance for late-day showers and thunderstorms too. Both the medium-range GFS and Euro models put bands of rain over New Jersey for next Wednesday, Thursday, Friday, and Saturday. Yup, an extended period of soggy weather — hope your umbrellas and windshield wipers are ready for a workout!